With the recent front page article on The Age promoting former MUBC'er Liam Santamaria's Downtown Ball podcast and website with NBL Tigers captain Tommy Greer, we thought this would be a good chance to follow up on our last announcement about Downtown to get Liam to share his experience with us. Hey Liam, congratulations on getting basketball onto the front page of The Age! you and Tommy must be pretty chuffed about the Andrew Bogut interview? Thanks mate – yeah it was pretty exciting to see the name of the website and the name of the podcast popping up on the major Australian newspapers. What really got us pumped was seeing the story featured on sites in The States like Bleacher Report and SB Nation. It was pretty funny seeing some parts of the Yankee media explain the meaning of the word ‘wanker’ to their readers! One thing’s for sure, Bogut shoots straight from the hip. We knew going into the interview that he isn’t afraid to speak his mind so we thought there was a chance he’d come out with something that our listeners would find interesting. To be honest, I actually thought the more interesting comment was what he said about the late Rick Majerus and how Majerus made him question his love for the sport. We weren’t expecting that when we asked him about his former college coach. Are We Still Trying to Win? Any thoughts on where you guys are gonna take things with downtown? Thanks for the props mate. Right now we’re just trying to build up a solid base of good content that’s unique, well-informed and interesting. We want to establish a reputation for Downtown as being the kind of site that Aussie hoops fans want to spend some time on when they’ve got a few spare minutes at work, travelling on the train or pretending to pay attention in a lecture theatre. There are heaps of sites out there reporting news and publishing results but that’s not us. We figure hoops fans will get that stuff from NBA.com, NBL.com.au, ESPN.com etc. What they want is a place they can read an interesting take on what’s going on, both here and overseas. So far it seems we’re right because the site’s popularity has grown really quickly – people who find the site seem to be coming back pretty regularly. You and Tommy have some really great on-air chemistry on the Grizz & Tizz From Way Downtown podcast. Do you think that’s the secret to the podcast’s early success? No doubt about it. We’ve been great mates for a long time and after playing together in the SEABL and then being housemates for a while, we’ve built up a good rapport. We’ve been told that comes across during our back-and-forths on the air. It’s also been great teaming up with Brett Thomas from SEN who has added a quirky, funny aspect to the show. But in the end, the biggest thing has been having some big name guests like Dellavedova and Bogut coming on for a chat. We’ve picked up a lot of new iTunes subscribers in recent weeks since those blokes have come on and right now we’re sitting at number 1 on the Australian iTunes podcasts charts for Sports and Recreation. Hopefully we can do an hour-long Scott Cuffe special soon and try to build on that momentum. You were part of the famous 98 Gold medal winning unigames team for melbourne uni. Got any good stories you can remember from that? Bloody oath…. But not many I’m willing to put to print. The main thing I remember was that winning the gold-medal game was pretty sweet but getting it done over Monash made it even sweeter. We had a really good squad, the core of which had played together at MUBC for a number of years. It was a pretty epic gold-medal game – played in front of a healthy crowd on the show court at MSAC. One of my strongest memories of the game was listening to the Monash crowd sarcastically chant “N-B-Elliot” when Elliot Dean was shooting FTs down the stretch. I thought that was pretty funny. I was only a 17 year-old first-year at the time so I was mainly focused on making sure I got into the venues of an evening. It was always a bit of a nervous wait in the queue outside. I see your older brother Ken was on that team too. He used to be the captain of our Big V team for many years? That’s right. I thought I’d get a free pass on the rookie-hazing with my older bro as the team captain but good lord I was wrong. I’m pretty sure it made things worse haha. Ken was a bloody good leader of that team though – both on and off the court. He made sure that Lucien Boland, Scott Cuffe and Jamie Cemm all got plenty of shots while simultaneously ensuring they all knew that Stuey Forsyth was the team’s best player. No mean feat. As a guy who was on an NBL roster at around that time, what was it like balancing all your basketball commitments with your studies and at the end of the day, was there a turning point for you when you decided to focus one way or the other? 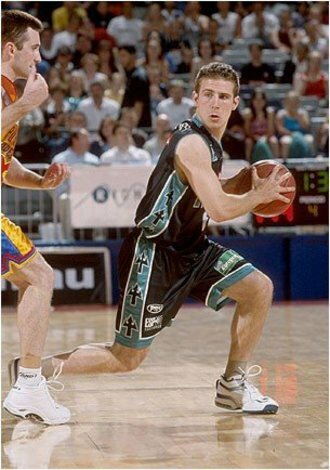 I wasn’t quite on an NBL roster at that stage – I was still playing U20s with the Melbourne Tigers and training with the NBL team during the day. The fact is, it wasn’t easy managing the schedule of lectures, tutorials, study, training, games as well as nights out with the fellas. Eventually something had to give so I put my studies on hold while I focused on achieving my dream of playing pro hoops. I did return to my studies after not too long though and made sure that I graduated. I’m really glad I did too because when the Victoria Titans folded and I ruptured my Achilles tendon it was crucial that I had a career off the court to fall back on. Now that you're calling NBL for SEN and writing/podcasting with Downtown, you are one of the few public voices out there really giving some love to basketball. Any thoughts on why Aussie basketball isn't getting the media coverage it deserves? Well, there’s a myriad of reasons for that which have been discussed over water coolers and pub bars ad nauseam over recent years. The bottom line is that the NBL is on the up again now that it has demerged from Basketball Australia. The 2013/14 season was a good one and featured some seriously entertaining talent like Chris Goulding, Sam Young and James Ennis. With the new ‘marquee player’ rule being brought in and the NBL office being proactive in its attempts to grow the game – things are really looking up. As far as the media is concerned, what’s required is for people to go out and try to make some things happen. For too long basketball people in this country have sat on their hands and complained that nobody was paying attention. We’re working hard to get more people reading, talking about and listening to basketball and hopefully that can help result in more people watching the games, whether that’s in the arenas or on the TV. And you know what else would help? Not playing Dr Alban’s ‘Sing Hallelujah’ at the games anymore. It’s been over two decades…. Enough already! and don't forget to facebook-like the downtownball page and follow the guys on Twitter! In Part 2 of this series, we go to recently retired NBL Tigers captain Tommy Greer and he spills the beans with the inside word on NBL salaries! © Melbourne University Basketball Club 2019. This page was last updated by smoke on May 22nd, 2017.